That is what I learned happened to my father in 1937 when I quizzed him about a small package of black & white photos, postcards and seashells. Why were you in Long Beach for a month? "I got sick two times and the doctor said I had to leave Salt Lake City or I could get sick again so we moved to Long Beach for a month and stayed near the Rainbow Pier. Doc said I was run down and needed to rest. I think his name was Dr. Curtis. I think I had maybe the flu and then measles.We stayed in the Caldwell Apartments." "Yes, that's it. Those taller ones in the middle. They had murphy beds! Those apartments were right near Rainbow Pier that led to an amusement park that was called The Pike. It had a roller coaster and a midway. It was there for many years. All right on the ocean front. We went fishing off Rainbow Pier, dad and I did. That was done with the old fashioned lines that you twirled around and threw out, fishing poles weren't popular in those days. Some people had them but we were tourists." Do you remember this photo? Who is Jr.? "No idea. I knew a Jr. Lindsey in Salt Lake City but I don't think this is that Jr. Why in the world would Jr have been there? I do remember that bathing suit." You sure don't look like you are sick in these photos. Recognize any of these kids? Sonny, Margaret, Harry, John? "Nope, not a one. Must have been friends I picked up there. I recognize the kid in the middle, that's me!" Remember anything else about them? How did you get to Long Beach from Salt Lake City? "I can't remember what car my dad had before he bought the 1939 Chevrolet. I know we didn't come in the 1929 Dodge. And we didn't go by train. It annoys me that I can't remember the car. I'll keep thinking about it. You should look for a photo of it." These colorful linen postcard booklets of Catalina Island, Boulder Dam & Long Beach were tucked inside an envelope from The Wigwam Indian and Abalone Jewelry shop that was located at 103 E. Seaside Blvd. Long Beach, CA. Do you remember visiting these places? "Yes. We went to Catalina on the great white steamship. I went back two times I think with Virginia (my mother) before the steamship went out of service. One time, Brother Barney was on the ship, a guy from the Salt Lake Wilford Ward. He was on vacation and just happened to be there. Virginia was with me on that trip. I love those postcard booklets. They stopped making them because they got more money selling individual postcards." 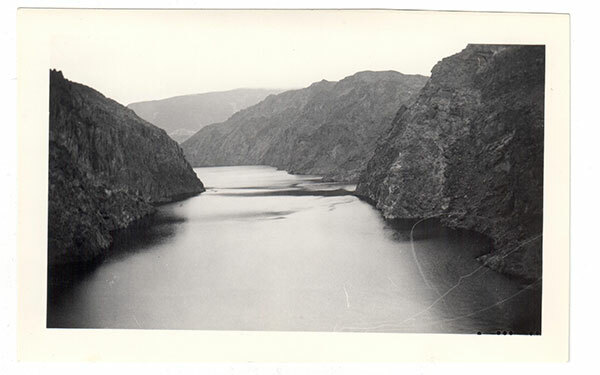 What do you remember about Boulder Dam? "It was still under some construction I think. I remember it wasn't filled all the way." Photo taken by one of my grandparents with a Kodak Brownie. "How old was I on that trip? 6? I think They took me out of first grade at William Penn and started me that fall, again, in first grade at Roosevelt. I was always older than the other kids in school because of that." Did it bother you to be the oldest kid in your class? "No. I was just another kid. Some of the things that I hear about bothering children today, I don't remember any of that at all. Some thin, some fat, some brown, some black, some white, we just went to school. We were all just kids and we went to school. I don't remember anybody picking on anybody. Occasionally kids would argue and fight, but they were just being kids." Remember anything else about the trip? "I remember I caught a crab off of Rainbow Pier in Long Beach and took it back to the apartment. It escaped and we never could find it. There was a breakwater underneath the pier. You could go out on the rocks and I was fascinated by the crabs. I learned how to pick them up and not get bit. You just pick them up in the middle of the back, and they try to pinch you. Don't pick up the big ones, they have bigger pinchers." Looking at the camera is Hilda, my grandmother. She passed away when I was 13 so my memories of her are quite limited. The thing I remember most about her was the way she smelled - like mothballs, cough drops and jelly donuts. Looks like Dad felt better when he got home to Salt Lake City. He saw this and said, "Hey, that's my igloo! They weren't a very smart thing to do in those days. They could fall in. That's the last thing you want to do is be in one of those things when they caved in on you. It sure used to snow a lot more in Salt Lake." * I Googled Measles+Salt Lake City+1937. And sure enough, in the March 12 1937 Salt Lake Tribune, "Measles showed an increase in 1937, there being 111 cases in the eight-week period, while last year in January and February there were only 24 cases reported." * Google Books - Title: Long Beach Fire Department by Glen Goodrich. In it were photos of the Caldwell and a 1944 fire. "...the Caldwell Apartment complex caught fire and quickly grew to a three alarm blaze. The fire lasted 11 hours and left 30 families homeless... The arsonist was caught less than a month later, he confessed to the crime." * The Wigwam of 103 E. Seaside Drive is now the intersection of Pine & Seaside Way.